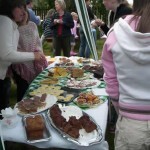 Great Gidding School is holding its Summer Fete on Saturday 7th July from 12pm onwards. There will be fun things to see and do, as well as lots of food to eat. Please drop by the school if you get a chance and it isn’t raining too hard!